The Staff Selection Commission is revamping the existing modality of conducting the Combined Graduate Level Examination (CGLE), 2016. According, the CGLE, 2016, which was scheduled to be held on 8th and 22nd May 2016 has been postponed and wound now be held in the month of August, 2016. The exact dates for the Tier-1 Examination would be hosted on the Commission's website shortly. This decision has been taken in the larger interest of the candidates appearing for this Examination. Tier-1 Qualifying : It means that the marks of Tier-1 will not be considered while making the final merit list. Tier-2 Online :Tier-2 will be conducted online i.e on Computer. 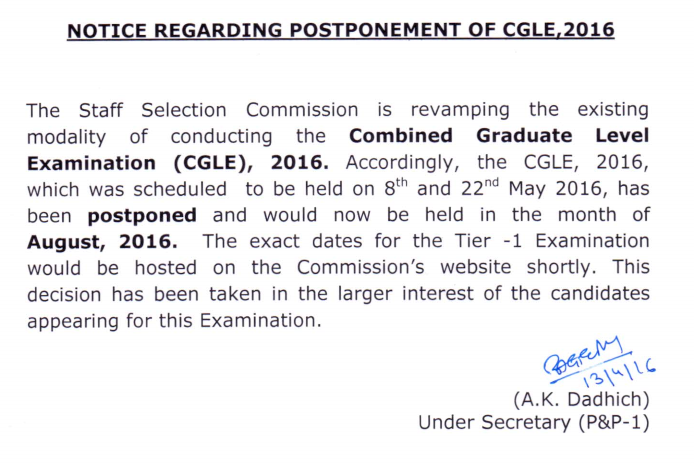 Post your views about the changes made by SSC in this year CGL Exam.